The weather barrier for the tiny house is a fluid applied product by Prosoco. The product, an equivalent of $1500, was donated to us by the company there by securing our first sponsor! 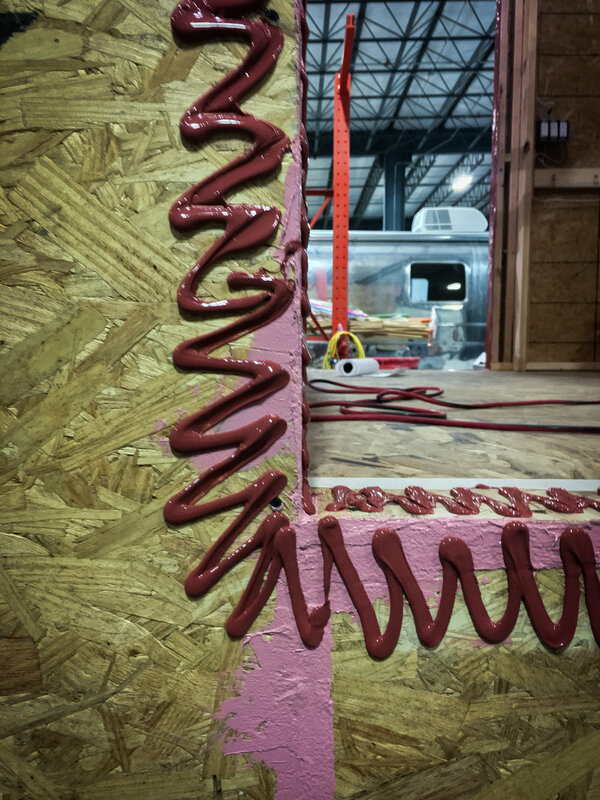 Our motivations for using the Prosoco R-Guard weather barrier system over a more standard house wrap, like Tyvek, had to do with the aesthetic and assembly of the tiny home's exterior rainscreen system. The rainscreen will be comprised of thin, vertically-oriented timbers, sealed using the Japanese shou sugi ban method of charring and blackening the wood. There will be a 1/2" gap between these vertical timbers, revealing whatever weather barrier condition lies behind it. Tyvek would, of course, stand out starkly from behind the black rainscreen timbers and compromise the exterior aesthetic. We need a dark, recessive weather barrier, and Prosoco's 'dark bronze' Cat 5 product suits our needs perfectly. These products have been used in numerous projects by Studio 804 at the University of Kansas School of Architecture and Design and was recommended to us. We had the pleasure (and luck) of being in close proximity to a local product rep who was very generous in advising us on the proper applications of the product. Above: Application of the R-Guard joint and seam filler over an exterior OSB joint. The product is applied generously from a tube and then evenly distributed using a putty knife. The joint and seam filler was applied to all exterior joints and corners, including the roof. It was also applied on over-driven screws that created recesses in the OSB surface. Above: Application of the R-Guard FastFlash at a window opening. Similar to the joint and seam filler, the product is applied generously from a tube and then evenly distributed using a putty knife, The FastFlash was applied to all window and door openings, including skylights. The material is quite viscous and has a build of 3/16" once applied. The product was applied, like flashing, to the depth of the window and to the OSB surface immediately surrounding it, but not to any surfaces at the interior of the tiny home. Above: The application of the joint and seam filler and FastFlash had to be done on separate days, as the products each take about a day to dry. 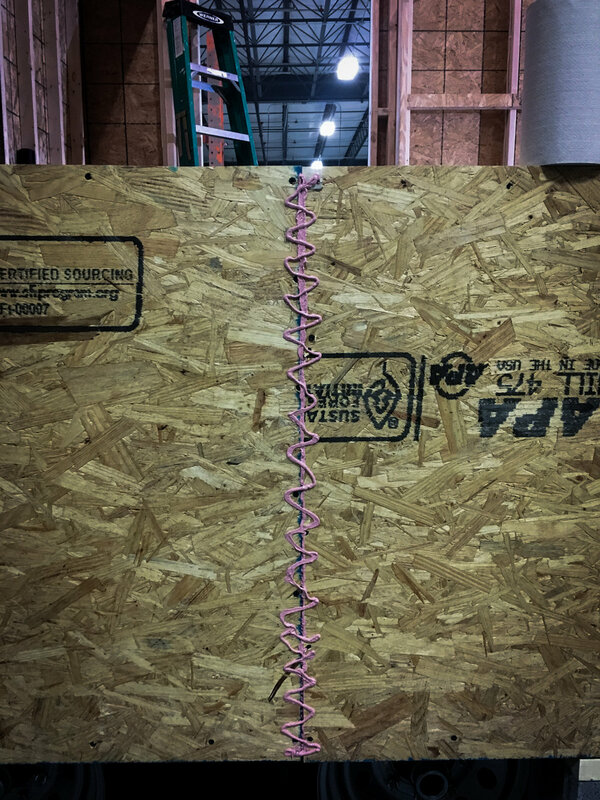 In preparation to apply the Cat 5 air and weather barrier, we removed all of the product stickers on the surface of the OSB sheets (this would not have been a problem had we installed the sheathing with the smooth surface on the inside). The Cat 5, which comes in large buckets, was applied to the exterior walls in a single day, using paint rollers (it was not applied to the roof because roofs us underpayment that is more durable for asphalt shingles, metal standing seam, or roof tiles). The material should be applied heavily, leaving the finished coat thick and consistent, with no OSB, joint and seam filler, or FastFlash visible. In our first application, the material had not been copious enough in some places and had to be covered with a second coat two days later once the first coat had dried. The material must be mixed well before each use, and a tarp should be laid under all edges where applied, as it drips heavily while it dries. We found that our paint rollers had to be thrown out after each use, so an optimized work flow is encouraged, rather than a piecemeal one. Special care should be taken to protect your hands and body: wear long sleeves, pants, and latex gloves but keep in mind that they can ruin clothes and stain your skin temporarily. Overall, we are exceedingly satisfied with this product in terms of ease of application, functionality, and aesthetic. An added advantage that we had not anticipated was the product's behavior as a natural binding agent for the exterior sheathing, further reinforcing the rigidity of the tiny home.